We arrived early to set up camera’s in the Officers Mess area. This is a long corridor with six rooms, probably used for army personnel to work & rest. Room 1 was set up to watch the four cameras. We had cameras set up in room’s 4, 5 & 6, and one looking down the corridor. The only equipment we had to use was hearing enhancers and electronic voice recorders. Our aim was to gather evidence. Group A sat watching the camera’s with Kerry, whilst I took Group B into the rooms. In room 4 only myself was swayed back & forward. Room 5 not too much, but one guest stayed in there whilst we moved to room 6. That guest shortly joined us as he heard shuffling next to him, and an intake of breath as if someone was about to speak. He had no hearing enhancers on. The last room felt very different, all females being pushed/pulled/swayed. Felt a lot colder in this room, was feeling cold spots, and one guest felt a cold touch on their hand. Tingling feelings on head and face too. Guests didn’t like the far right corner, feeling very uncomfortable whilst standing there. After 30 mins we swapped – Kerry took Group A and they experienced swaying in rooms 4 & 6, although only myself and Kerry in room 4. Someone heard whispering with the hearing enhancers on. Another guest was touched on their leg. Again this group didn’t like the far right corner in room 6. After a short break we took Groups C & D. I took Group C first and again we were experiencing swaying in room 4. In room 5 I was sure I saw a male spirit standing in the far left corner, others were feeling uncomfortable in this room. I then saw a shadow move a few feet away from that corner. Time was approx 22.45 – not sure whether our camera was facing that way. In room 6 many of the guests were swaying. Jo then took group D first to room 6 – a loud noise was heard by someone with the hearing enhancers on. When in room 5 they felt uncomfortable in this room. In room 4 many were swaying again. Whilst we were watching the cameras in room 1, the room suddenly felt extremely cold, starting with our backs, then eventually all over. I then had Groups A & B again, and this time the focus was on EVP’s. Jo took group A and one guest whilst standing in the front right corner of room 6 was feeling very sick. When someone stood in the far right corner they felt static around them. Also Jo & guests being swayed and pushed in this room again. Whilst playing back their first EVP in room 4 someone asked “did you die here” and they were sure they heard a male “yes”. I then took Group B, and when playing back our first EVP in room 4, we were sure we heard a male whisper after Justin’s (guest) question. In room 5 before we started the EVP Lee (guest) whistled out asking spirit to copy. No reply was heard but I suggested Lee do this again on the EVP, which he did. Whilst playing it back we heard two whistles before Lee asked his question. However, whilst wearing the hearing enhancers Lee heard a whistle after his question/whistle request, but on playing back again it was not heard, concluded Lee may have heard the whistle in ‘real time’ not on the recording. We moved to room 6 and Karen (guest) was shoved back three times, she asked spirit for more, saying “is that all you can do”, but received no more. However, she was the last person to leave that area when we finished, and whilst walking out she thought someone was walking alongside her, she looked but no-one there. She had the feeling the spirit was escorting out. Myself and Kerry took Group’s C & D for the final session of the night, however with both groups feeling tired, each time EVP’s were recorded, nobody could be serious and kept laughing. A brilliant night – great fun and lots of very different experiences. Fort Horsted is one of our favourite locations, not least because we have investigated here numerous times and had some truly amazing results; it is always entertaining and amazing for one reason or another. This time was no different, although equally strange as no-one could have expected what turned out to be a first for us. Everyone was split into two groups, which was somewhat larger than normal because one of our GHE team could not attend. However since we know the Fort extremely well this did not deter me & Carl from taking the guests to the most active areas. We also chose two areas that we the furthest from each other so that no noise from either group would affect the other. The area that I chose is an area which we often hear and feel much the same sort of stuff time after time. We were joined by Annie a female nurse aged in her 20s from The First World War who was stationed at the Fort and a 1960s male spirit who was about 50 years old and quite grumpy. I started with a séance, as this is the best way for the guests to get a physical experience. Arm movement started to occur quite quickly and usually on command, the guests could ask which way their arms should move in their heads and the spirit would comply. I also had several KII (EMF) meters in the room which also showed spiritual activity. Many whistles, bangs and mumbling voices were heard throughout the séance, which is actually quite normal in this area. One guest felt a touch on their head. When I suggested that guests hold out their hands in a particular area of the room so that Annie could touch them, those guests that participated could feel strange tingling sensations and that their hands were being squeezed and touched and in some cases people felt that their fingers were being pulled apart. The second group to this area were also treated to the same spirit energies and once again lots of arm movement on command was felt by the guests, as well as lots of more physical movements some of which looked painful, especially as guests were moved in ways which they wouldn’t either choose to move or wouldn’t move as they know it would be painful. We also moved to an upper room during this session and came across a spirit called Simon who was about 20 years old and smartly dressed. In this room we heard some odd sounds, which I likened to hearing a conversation that we couldn’t hear the words, just the sound of a conversation. I took a lot of guests, probably the majority to the Counterscarp Galleries, however very little happened because there were too many people making lots of noise, however one guest did hear her name being called out, which she thought was her friends, but they were with me and neither of them called out. The stand out moment of the night didn’t happen with me, but happened with Carl in one of the magazine rooms, as the guests were randomly taking pictures, one of them thought that their picture contained a face, so then everyone in that group took a picture and many of them, not all, had photographed a face on the wall. Carl was keen to rule out Pareidolia so looked at the wall and rubbed any loose dust from the wall. 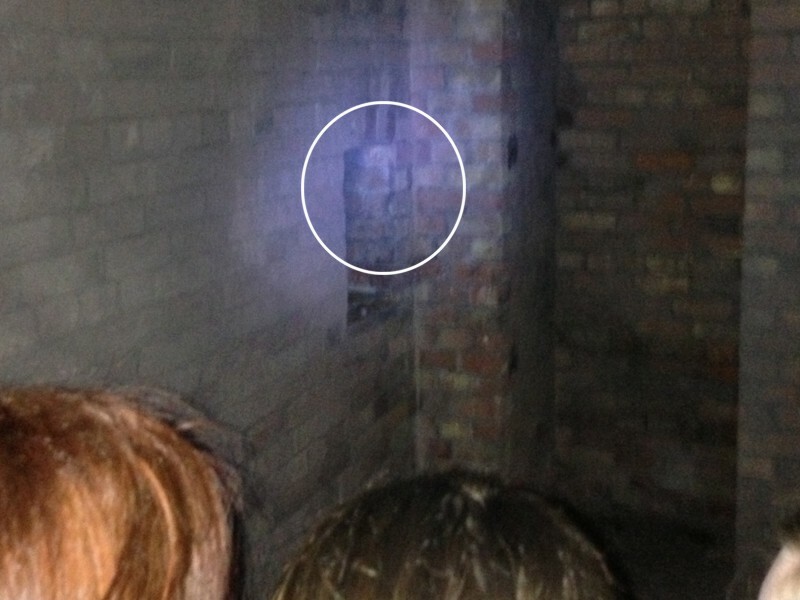 Nothing could be seen when he stood in front of the wall, but when he stood back and some more photos were taken, the face could easily be seen and photographed. Below is the picture taken by the guest and we have circled the area to look at. I too investigated this phenomenon and have several photographs and I don’t really have a credible explanation for this, as we have hundreds of photos and videos from this Fort and of this room and we have never seen anything like this. If indeed it is a pareidolia effect then surely we would be able to all see it all the time. Which was not the case on the night. Several EVP (Electronic Voice Phenomena a.k.a. ghost voice) experiments were undertaken throughout the night, but unfortunately nothing audible, or clearly audible could be heard in the recordings. In all of the possible EVP’s, we can hear the start of a response, but the background noise or noise made by a guest talking or shuffling ruins the possible EVP. Which is a shame as we have had many great EVP’s recorded at Fort Horsted. All in all this was a great ghost hunt, with lots of physical and unexplainable paranormal activity felt by the guests throughout the night. Pluckley is a great place to go ghost hunting, but you need quiet and because of the popularity of Pluckley amongst local teenagers it is hard to find times when it will be quiet, fortunately for us this was one of those days. Our first stop was a usual place for me and spirit energies often pass along this path. As I was explaining how to use the various different items of our ghost hunting kit high levels were seen on our KII meters although one of the communication devices wasn’t working how it was supposed to, whether this was the device itself or spirit interfering with it, we’ll never know. A female energy approached the group cautiously although when she did come close enough she was happy to communicate via the electronic equipment, but not keen to divulge information about herself. After a while I held a séance as there was a male spirit energy present. Although he wouldn’t tell me his name, he was in his late 50s, quite stocky build and had large sideburns and smartly dressed. This energy was able to move the arms of some of the guests and push and pull one of two of the guests. During the séance some odd noises were heard by the guests and me. These noises were not animal sounds, but more like the sort of noise a person would make walking through the undergrowth as the footfalls were sometimes quite loud. The second location I was using my spirit box (a device that plays snippets of radio stations, running at 100ms and scanning the FM radio bands in reverse) We all heard “Hi”, “Hello” and “Me” but none of the questions asked got a definite response. Whist we were listening to the spirit box several guests saw some red lights in the trees not on the path, which is a fairly common sight. As a guest and I were turning around to look back at the spirit box, we both saw strange white lights further along the path, these lights were much bigger than torch light and at the time it looked like car lights, which would be impossible because of where we were in the woods. However we all walked in the direction of the lights to investigate. When we got to the end of the path, where it turned left and right and we didn’t see anything that could cause the strange white lights I decided to turn on the laser grid as this has proved to be successful in past ghost hunts. There were two spirit energies that approached us, a brother and sister, wearing no shoes and dressed in what some would describe as being “peasant clothing” and although they didn’t show up in the laser grid I approached them with a guest and asked that the spirit energies touch the guest. The guest felt tingling sensations in their hands and as their hand was held out they could feel the spirit energies touch their hands. Several other guests also came over to join us to feel the same sensations. From here we moved back into the woods and into a much more dense part of the woodland. We were joined by Simon, a male spirit energy who was about 5’7” in height, with blonde hair and fair skin. He was quite muscular and 24 years old. He was from the 1950s. We were all standing in a circle and I asked him to touch some of the guests, one guest in particular felt a tingling sensation around her face, neck and head as Simon said he would touch this guest. Many of the female guests stated that they had sore backs and all said that it felt much more comfortable when slightly bent over. This sensation has been reported in this particular part of the woods before on past ghost hunts, but it only seems to affect female guests. Once again a productive ghost hunt with all of the guests feeling some form of physical spiritual and paranormal activity. 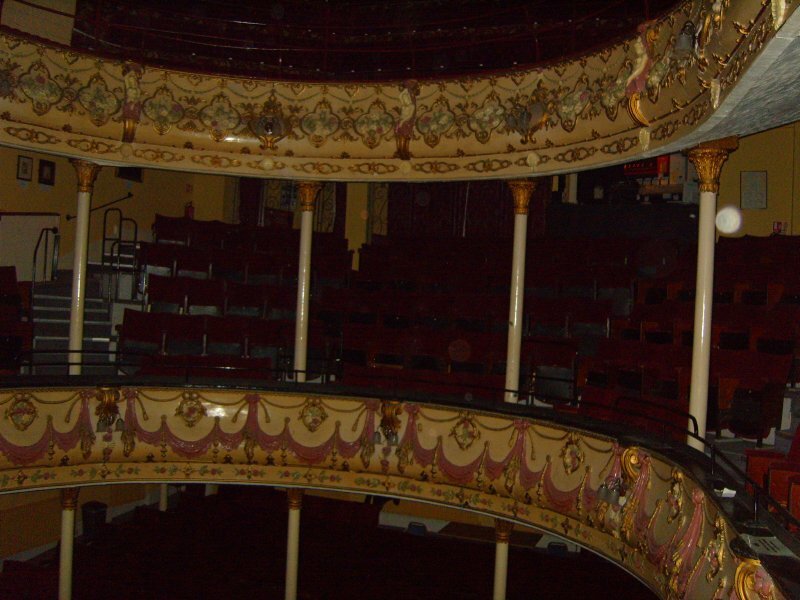 It is not often that active theatres are available for ghost hunts because of their schedule of productions. So when this theatre became available we jumped at the chance. 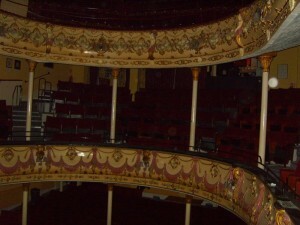 Due to the nature of a theatre we did not intend to do what we usually do at a ghost hunt. Instead of different groups being in any particular area for any length of time, we just let the guests hold their own ghost hunt in whatever area they wished. We then would join them at various intervals to assist their ghost hunt. This approach worked well because there is no way that we could have conducted different sessions because noise travels throughout the theatre. We gave all guests some of our equipment so that they could venture off on their own. Whilst I was in the theatre talking to guests I became aware of a male spirit energy, his name was Edward and his wearing typical Victorian theatre attire; Top hat and tails. He was 72 years old and told me that he was waiting for a performance from Margaret Stevenson. (Our researchers have yet to find any actress with this name). Carl (Ghost Hunt Events Team member) was sitting in this area and he was able to detect Edward with a MEL meter & KII meters. The guests that were in this area watched as Edward managed to affect both the MEL & KII meter. I then went off to find other guests, some were backstage and waiting to go to the Fly Floor, this is an area above the stage where the control of the backdrops occurs. Whilst in this area I felt severe pains in my chest, which I could imagine a heart attack would feel like. Several of the guests also felt a tightening of the chest but nothing painful, although they did feel some strange cold spots. As soon as I left this area the pain subsided. After catching up with some more guests below the stage, they too wanted to go to the Fly Floor, so having just recovered from that session I returned hoping not to feel the same pain. Fortunately I didn’t get the same sensations. A male spirit energy in his early 20s was now present, he seemed to be from the 1960s and when we held our hands out, we could feel the warmth of his energy and many guests reported a tingling sensation in their hands. There was also an unhappy male spirit energy present and this spirit made one of the male guests cry. The same guest also felt both hot spots and some extremely cold blasts of air around his face. Whilst asking for spirit to repeat my knocks on a wooden beam, we heard a strange tapping noise back, although the noises sounded like someone tapping on concrete. I suggested that since the majority of the guests were backstage that we hold a séance to try to get those energies to interact with us. A Scottish spirit energy joined us and a very loud and outspoken male energy, both in their 20s. After a while many guests’ arms were raised, mostly on command and the spirit energies then went on to push people and sway them. There were also lots of occasions when the spirit energies were using peoples arms to stroke shoulders and heads of other guests. Back in the theatre I joined a few guests sitting quietly in the upper circle and turned on my spirit box (a device that scans the FM frequencies at 100ms in reverse) and asked the spirits that I could sense; a little girl of about 9 years old eating an ice cream called Dorothy and a strict looking women from the 1950s era waiting for someone to return from the bar to speak to us via this device. We all heard “Hi”, “Hello” and “Steve” then when I asked how many of us were sitting down we all heard “Not Sure” and other various words that didn’t make sense. As we were sitting here we became aware that the door on the opposite side of the theatre was opening and closing as if someone had walked through it. (Other team members had reported this happening when they were in the area) Since we were the only people in the circles (other guests were backstage or on the ground floor) we tried to emulate the door swings and we could not. There was no breeze to speak of and when we opened the door we couldn’t get it to react in the way we had previously seen. Whilst standing here I was aware of another male spirit standing near to Carl and a guest on the ground floor. Both could feel a coldness as they neared to the spirit, which was in front of a radiator (which was on) and a tingling sensation. Carl could also see several spikes of EMF energy on his MEL meter. 11.30pm: it quietened down and I managed to sit by myself and see if I could sense anything. While on the top floor (balcony), I saw a couple of shadows move across the seats beside me – nobody else was on the same floor with me and I could find no explanation for the shadows. 12.00am: I moved down to the middle floor (circle) and was sitting in the seats at one side of the auditorium. After about 10 minutes of sitting quietly, I saw some orange lights over the …stage area. They were not distinct, more a shimmer. I thought it might be from the emergency lighting but when I looked at all the emergency lighting units, they were all giving out a steady light so were not the cause, nor could I find any other light source that might have caused the phenomena. 12.30am: I went down to the ground floor and stood, leaning against the stage, looking out into the auditorium. I was hoping I might see the spirit of the former theatre manager who is supposed to come into the auditorium through the back doors, but no such luck. I did, however, get the sensation of someone or something touching my hair! Another guest (Penny) heard her named be called out, but didn’t take any notice at the time as she thought it was her sister calling her. However at the time her sister was with me, firstly below the stage and then on the Fly Floor both of which are backstage, Penny was in the main theatre. Many guests also reported feeling odd and strange when initialling entering the Royal Box, although they all reported that these feelings dissipated very quickly. An unusual investigation just because of the lack of our usual controlled sessions, but nevertheless an active ghost hunt, which didn’t become apparent until all the recordings were analysed. We have shadows and other oddities recorded from our video footage as well as numerous audio recordings that are still being analysed.